textiles | What's Your Livelihood? 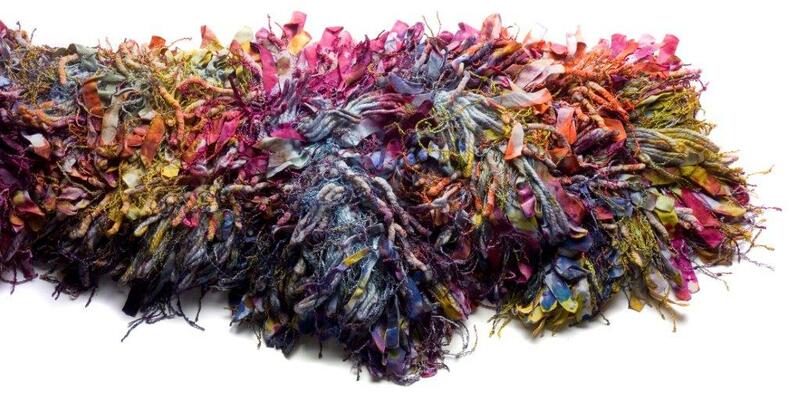 I start the process of creating new art by gathering threads, yarn, braid, tape, and yardage, all of silk, wool, cotton, linen, or other natural fibers. First, I consider their inherent characteristics along with the extent to which they are suitable for becoming the basis of artistic form. Then, I contemplate various ways through which their surfaces can be embellished using such techniques as stitchery, silkscreen printing, airbrushing, and hand painting with dyes. At this stage curiosity develops, questions arise, experimentation is needed, and creativity soars. …curiosity develops, questions arise, experimentation is needed, and creativity soars. 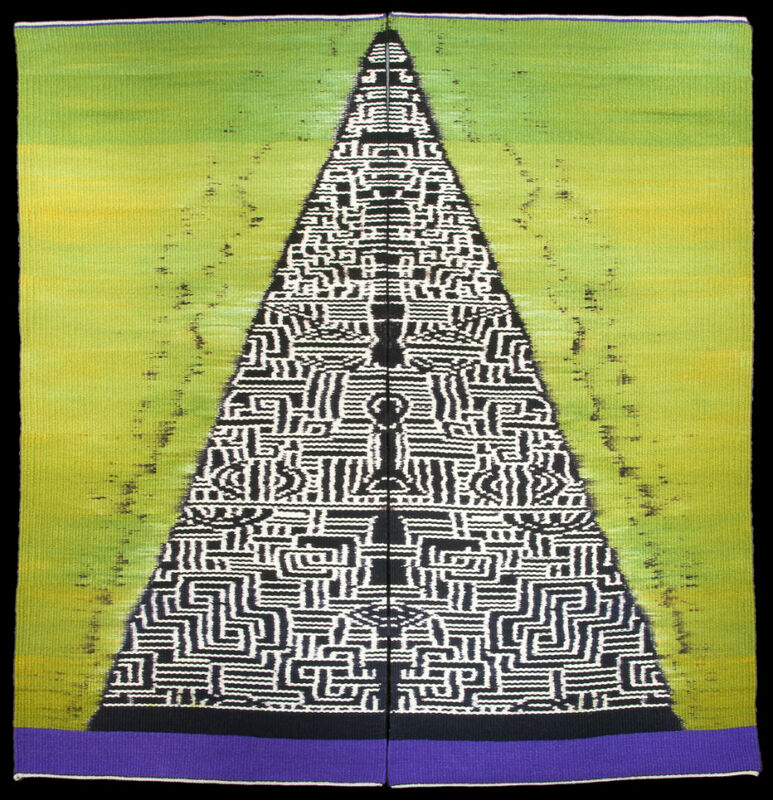 Robert Hillestad is a studio textiles artist and design educator. His designs have been shown in more than l50 juried and invitational exhibitions and stage presentations throughout the U.S. and abroad and are included in numerous collections. 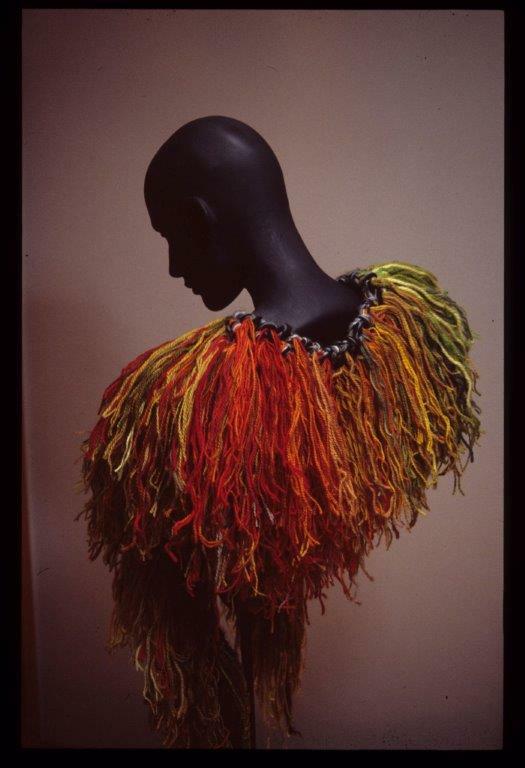 He is the author of Robert Hillestad: A Textiles Journey (2008) and 50 articles about textiles and costume. He is a Fellow in the Costume Society of America and the International Textile and Apparel Association. He received the Lincoln Mayor’s Arts Award (1996) and the Nebraska Governor’s Arts Award (2008). 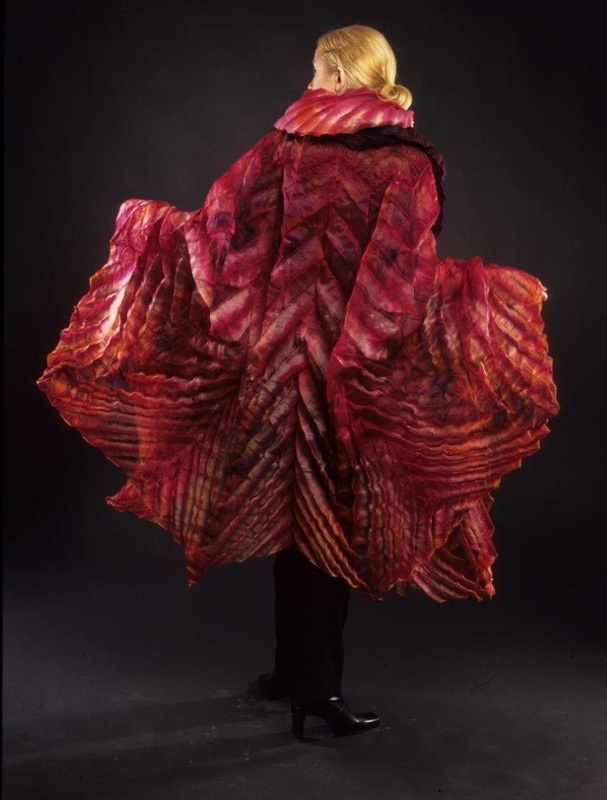 When he retired from a 31-year career at UNL (1996), the Robert Hillestad Textiles Gallery was named in his honor. Dr. Hillestad earned degrees at the University of Wisconsin, Drexel University and The Ohio State University, did post-graduate work at the Art Institute of Chicago and completed a year-long study in the Paris couture. He works and resides in Lincoln, Nebraska. In retrospect, I am convinced that it was the hand of destiny that led me to take the purple stole of penance out to the playground. I don’t think I REALLY intended to hear my classmates confessions, but when they saw me, with that familiar stole around my neck, setting on a little chair behind the lilac bush…they became overcome with remorse over their misdeeds and frankly told all. Suddenly I was something more, someone immensely not 11 years old. I was instantly linked to a lineage of power and holiness, an initiate into an ancient and exclusive club that boasted a membership list that included guys like the Pope…all this achieved just through the simple act of putting on the purple stole. One week to the day, my best friend, Cindy Thornton, and I smuggled our roller skates into the church sacristy. Cindy reached into the enchanted wardrobe of clerical vestments and pulled out the garments for Advent and I grabbed the Latari Sunday pinks. Within moments we were bedecked and bedazzled, robed, cinched and tassled. The skates went on, and swinging heavy brass incense sensors like we were giddy aromatherapists, we headed down the center aisle. Father Rose was standing at the end of the aisle waiting for us that day, over by the baptismal fountain we failed to clean. We literally skated into him. I received an immediate and irrevocable career demotion and was relieved permanently of my altar care duties. Cindy Thornton was grounded from playing with me for the rest of the school year and all hopes of sainthood or an early canonization were temporarily put on hold. For over twenty-five years I have been creating tapestries, rugs and prints that are based on my interpretation of archetypal symbols. 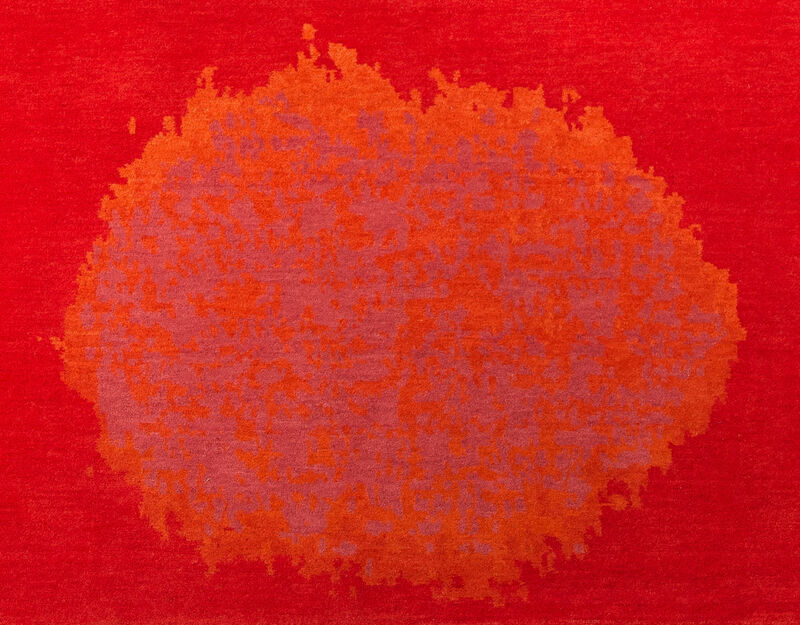 I am one of a very tiny handful of artists in the world today whose work is built upon an ethnic surface design process called weft faced Ikat, a complex textile technique for contemporary image making. 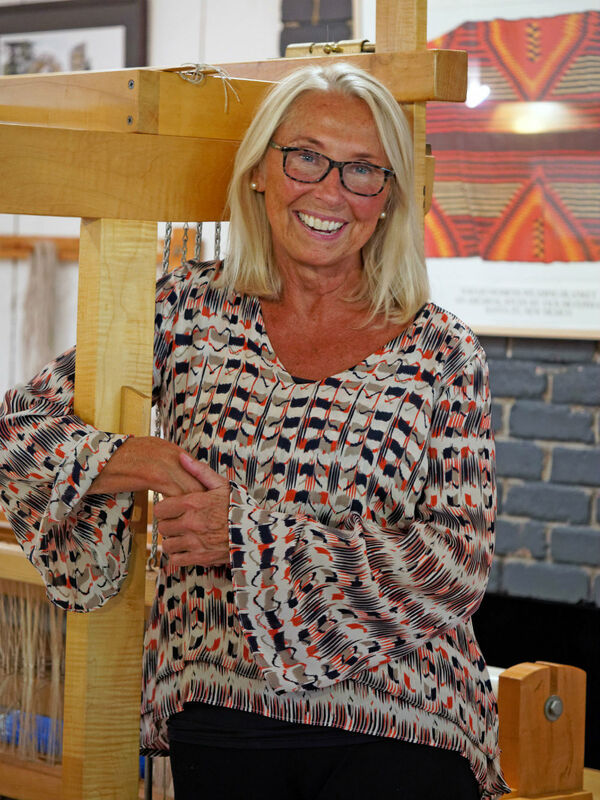 Largely a self-taught weaver, I formally studied art at St Marys College, South Bend, IN, the University of Notre Dame and the School of the Art Institute of Chicago, after my education turning to a fascination with ethnic textiles and symbology. My work is included in 18 United States Embassy collections on four continents, and in museums, corporations, and personal and public collections globally. 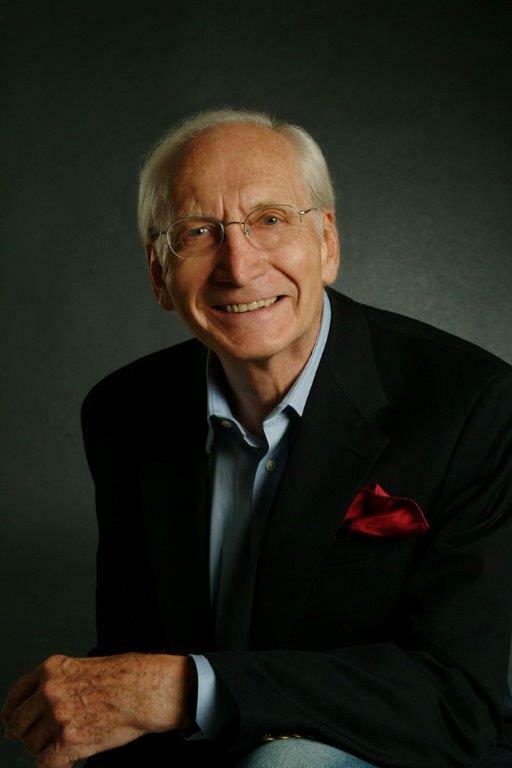 Internationally I have served on the board of GoodWeave USA. 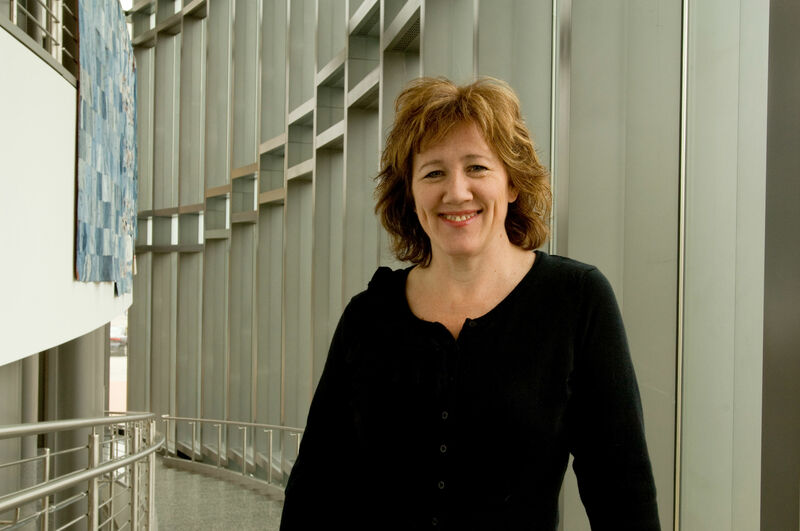 Nationally I work as Co-Director of the American Tapestry Alliance and locally I am Board Chair of the Omaha Union for Contemporary Art and a 2008 former resident of the Bemis Center for Contemporary Arts. My studio is located in the Co-Lab at Alley Poyner Macchietto Architecture, 16th and Cuming, Omaha. 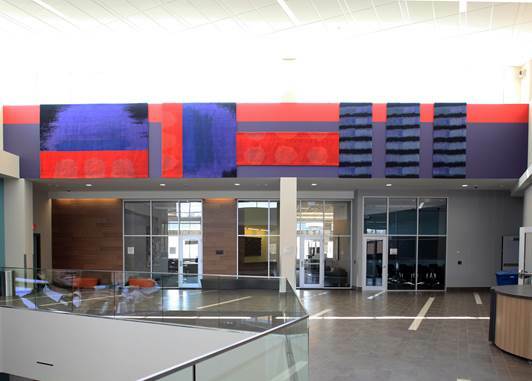 My most recent public art project is a massively scaled 8’(w) x 55’(l) tapestry installation, Red Tapestry Wall, in the Community Education Center, University of Nebraska-Omaha, dedicated in April 2014. 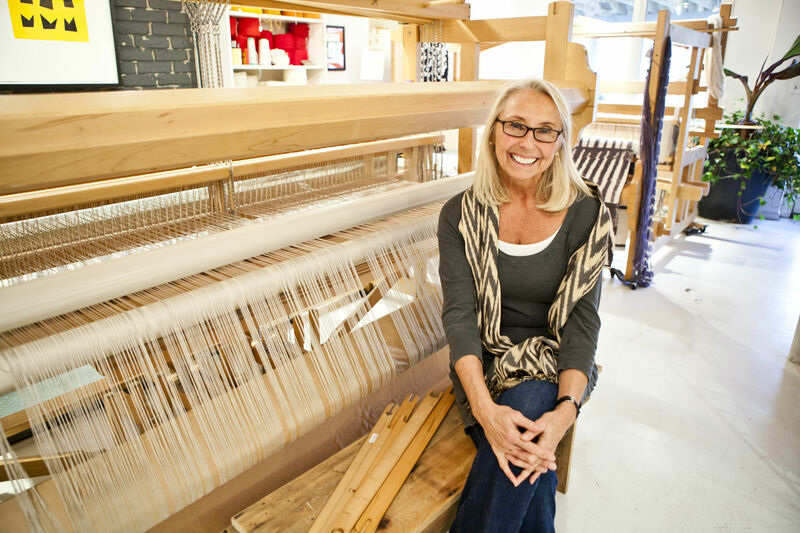 My passion for textiles began before I really can remember. My earliest memories are watching my mother’s hands fly as she fed fabric under the needle on her sewing machine. I was sure she was going to catch her finger instead of fabric! My father couldn’t pound a nail into the wall without hurting himself, so Mom was also in charge of all home repairs. I was her assistant. I learned how to take her sewing machine and the vacuum apart and oil all of the pieces. The small cupboard we constructed is still hanging in a corner in the house. As a teen I was embarrassed when, instead of buying an interesting item, Mom would ask if she could draw a pattern! 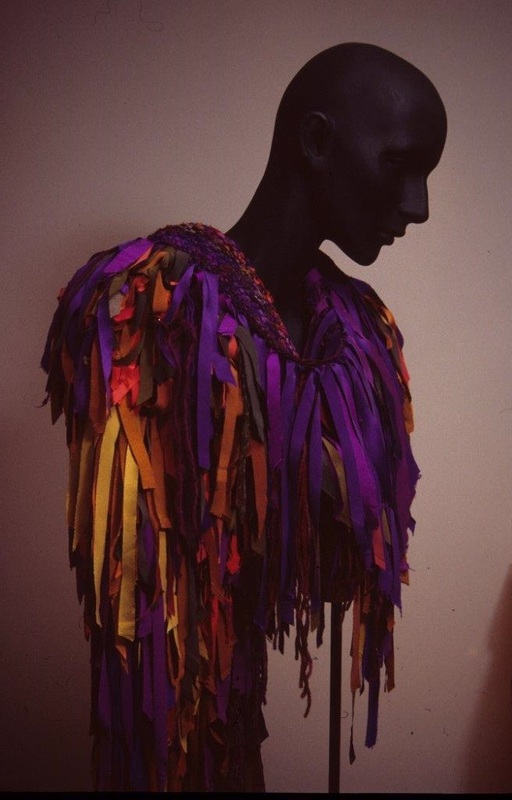 My mother and I explored whatever was fashionable in the craft world—embroidery, knitting, crochet, clothing construction, macramé, fabric painting. I wasn’t patient enough to match pattern pieces or undo work when I dropped stitches, so I gravitated towards embroidery and crocheting. I still have the turquoise purse with a yellow flower that I crocheted at age 8 and the denim work shirt that I thought was the epitome of cool in high school. As an adult, I honed my embroidery skills and began to design my own pieces. I also became fascinated with historic textiles. I frequented the library, looking for inspiration. It was during my “sampler stage” that I discovered quilts. The stories, the colors, and the life in the quilts fascinated me. I slept under a quilt made by my grandmother. Suddenly the fabrics—from my blouses, my dad’s pajamas, my mother’s dresses and my sister’s prom gown had more meaning. There was a connection there that brought me great comfort and kept me cozy at night. When I returned to school after a couple of attempts to find a career that intrigued me, I decided to pursue my passion for needle arts. I got degrees in art history, focusing on American textiles. And then, at nearly the exact time I returned to Nebraska to pursue my PhD, nearly 1,000 quilts arrived. I’ll never forget the feeling when I read the newspaper article that announced the donation. I knew at that moment my life had changed. I just didn’t know how much, or how wonderfully, it had. I was hired as Curator of Collections at the International Quilt Study Center in 1998: my dream job. I’ve traveled the world, made great friends, and literally played with quilts nearly every day since then. I can’t wait to see what’s next! Carolyn Ducey is curator of collections at the International Quilt Study Center & Museum at the University of Nebraska-Lincoln. She oversees new acquisitions and ongoing care of the International Quilt Study Center & Museum’s collection of nearly 4,500 quilts. Carolyn earned a M.A. in American art history from Indiana University in 1998, and her Ph.D.in Textiles, Clothing & Design, with an emphasis in quilt studies at the University of Nebraska in 2010. She has curated a number of exhibitions, including “Chintz Appliqué: From Imitation to Icon,” “What’s in a Name: Inscribed Quilts,” and co-curated “Quilts in Common.” She is author of the monograph Chintz Appliqué: from Imitation to Icon, (2008), and co-author of What’s in a Name: Inscribed Quilts (2012).